State-sponsored terrorism is ugly must be prevented, is unlawful, against international law, bring shame and disgrace on those who perpetrate it, and in the end, hopefully, rips the reward they deserve. But of course, the development of state-sponsored terrorism and its crease is also something of a complement to those of us who have been fighting terrorism for many years. Because it shows a sense of weakness and defensiveness in the government that causes that terrorism. And my view, and I think it will be shared by everyone on this panel today and everyone, or almost everyone in this room, is that civilized States and international organizations have a duty to use all legitimate and proportionate means in order to fight state-sponsored terrorism or any other form of terrorism. I have attended the Great Gathering in Paris, though I was not there, unfortunately, this year, because I was not able to be, I want to applaud what the NCRI, so well that by Madam Rajavi has done, particularly in the last twelve months. 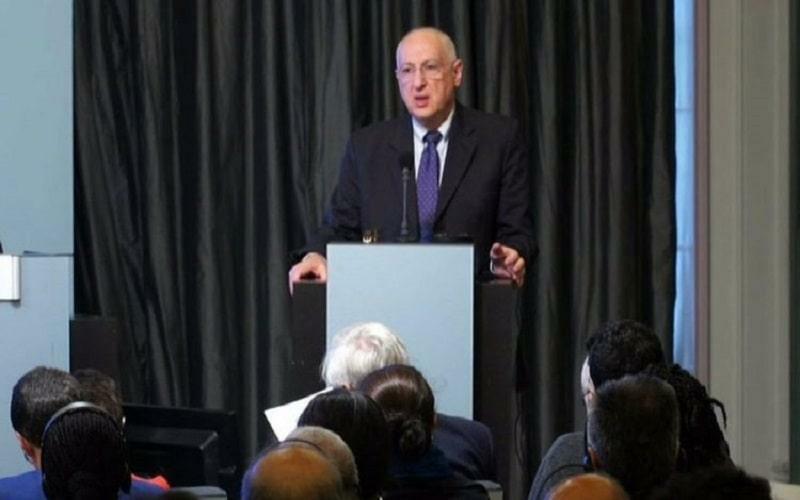 The level of unrest and the sense that people within Iran have, that they can and should be demonstrating their opposition to the regime, and its outrages have been much better organized in the last year, much more evident on the international stage, and very much thanks to the work of the NCRI in Europe and in the United States of America. I’d also like to applaud what has been done in Albania, where a large number of former residents of Camp Ashraf and Camp Liberty are living. I don’t know how many of you have visited them, but I have visited them twice. I think one should pay tribute to the Albanian government for what they have done in helping that cohort of displaced people. But the greatest tribute goes to those people themselves many of whom have suffered a great deal personally or through their families. They too, as has already been said, have been subject to attempted terrorism state sponsored by the regime in Iran. And if you follow media product about Iran, as I do on an absolutely daily basis, you will see the most extraordinary outpouring of fake news attacking the credibility and good faith of those Iranian people who have now taken off the residence in Iran. And if you read that and start to have some doubts just go to Tirana and meet them, and you will see how fake that news really is. I used to be the independent reviewer of terrorism legislation for the United Kingdom forum, by coincidence the day of 9/11, when the world to an extent changed, until 2011. So for the best part of ten years, and I have continued to scrutinize terrorism issues around the world ever since them, and provide consultancy services on that subject in the private sector. And my great interest in the future of Iran has helped me to see how the Iranian government is using everything it possibly can to attack to the cause of good government and democracy in the future in Iran, amongst other things seeking on a daily 24/7 basis to undermine Mrs. Rajavi and the NCRI, PMOI. They are about us in London all the time, pretending to be genuine journalists, pretending to be independent representatives of independent television channels, a lobbying politicians to the uncomfortable unreality, that somehow or other, we should start treating Iran as though it was just another government in the family of nations. It isn’t and we should remember that, and our governments and the European Union should be saying so. It’s very important, therefore, for the European and international institutions, to continue to work together to break groups of organized criminals and terrorists. And this is particularly important in the context of Brecks it, and I’m sorry to raise the ‘B’ word in this speech, but it is very important in this regard. It is absolutely vital that cooperation within Europe, within the European Union and indeed, within the Council of Europe, on counterterrorism issues, should be a given and not the subject of total negotiation. And I do not believe that the British Parliament, never mind what the government wants, I do not believe that the British parliament will tolerate any fudging on the subject of European cooperation against terrorism. Now is the time for all the governments of European Union countries, and for the European Union, itself, to speak out, to expose the reality of Iranian attempts at cyber-terrorism which are extensive as well as physical terrorism. We talk all the time about the Russians, trying to intervene in cyberspace, and of course, they do. But the Iranian regime gives the Russians a pretty good run for the money to use a British expression, but that’s not said as often as it should be. Until in my mind, and I’m repeating something that’s just been said, which is a matter of real regret that Ms. Mogherini has not spoken out with the voice of Europe against recent Iranian state-sponsored terrorism attempts in Europe and elsewhere. So, in the presence of some representatives of the media, I would like just to say a word to them. I’ve been knocking around British politics for thirty-something years and on the whole journalists, the busy people, they like to write the easy stories. They like to pick the low hanging fruit off the trees. This is a complicated story, the story of what Iran is doing in cyberspace and in relation to terrorism. But good investigative journalists, have a duty to expose that to the public at large, in the United Kingdom, and I suspect this is true in Belgium in France, in Italy in, Germany and elsewhere in Europe. Even politicians, professional all full-time politicians, are poorly informed on this issue because they receive much of their information from the media. And there is a great job needed in educating politicians and the public at large about the danger that Iran presents to our own national security, whichever country we live in, and also to organizations like the NCRI, which is the home of many good and decent Iranian people. One of the things, of course, that the media and indeed politicians, should expose, and a number of they’re all pretty lazy about this, is the state of human rights in Iran. When a group of students in a provincial city in Iran stand up and protest, because they do not have freedom of speech, because they don’t even have the freedom to work, if they are women, in certain walks of life, because they don’t have the freedom to write articles in the university newspapers which merely question whether the political settlement they have is a fair one. Those young people, those women are likely to run the risk of being imprisoned. And indeed it’s worse than that, Iran has the worst record of executions proportionate to its population in the whole world. And we have seen how people are executed, if there is a civilized way of execution, well it doesn’t happen in Iran. People are executed publicly from the horizontal jibs of building site cranes, and in other horrible and undignified ways like that, which make the practices of sixteenth century’s Europe seem civilized. So these are very brave people, and we owe a duty to them to speak out, to protect them, to protest their interests, to help them, and not allow our governments to sleepwalk through that situation in the interests of a few business deals, to build a school here, a university there and a factory somewhere else. A country that executes people, on an industrial scale, is not one we should be doing business with. And in my view, now it would appear collapsing nuclear arrangement, which I’m sure was entered into in good faith, looks pretty poor against the progress or lack of progress that has taken place in Iran since it was started. But I don’t want to end all of pessimistic note. I believe that if we can work together to deal with Iranian unsponsored state terrorism, if we can take constructive moves to show that there can be a better government in Iran, and incidentally the NCRI at the moment is the only organization on the block that has formulated a program of clear policies for the alternative government of Iran, if we can do those things in a positive frame of mind, then one day we will be talking about these issues, not in a beautiful hall in the center of Brussels, but in a beautiful hall in Teheran.